WINTER is here and for farmers not into winter crop production, it looks like the best time to put farming implements into the tool shed, take a break from the fields and enjoy the fruits of their labour. Experts however, contend it is time to start preparations for the coming cropping season. It is time to plough the land, have soils tested and apply lime where necessary if hopes for a fruitful yield in the future are to be kept alive. For Centenary small-holder farmer, Angeline Chitembwe, the call to start preparations could not have come at a better time. Thanks to the efforts to equip its members with farm implements by the Zimbabwe Progressive Pensioners Trust (ZIMPPET), this season Chitembwe’s land preparations have been made easier. Chitembwe is one of the beneficiaries of the Trust’s programme which is aimed at ensuring that its members get tractors and other farm implements to improve operations. Under the scheme, the farmer pays 30 percent of the tractor with the Trust loaning them the remaining 70 percent after which a payment plan is put in place for the farmer to repay the loan. The ZIMPPET is an organisation whose objective is to empower pensioners through training them in self-sustaining income-generating projects, especially those in the agriculture sector. “Over the past years I have had to hire a tractor from my neighbours and this affected my activities as I had to work according to their schedules. “Now that I have my own tractor I can plan ahead and ensure I do my land preparation in time. Chitembwe is a proud owner of a six-hectare farm that produces tobacco, maize, groundnuts and sugar beans. “Since I retired from the army in 2013, my dream was always to fully utilise my six-hectare farm, but I was failing because I did not have adequate resources. Chitembwe commended the Trust for putting in place the programme, which she said would help farmers’ activities and ensure improved yields. The programme to equip farmers with the requisite farm implements is in line with Government’s programme of farm mechanisation which is expected to help in the transition by small-holder farmers from using human labour to adopting the use of machinery. Already, under the More-Food-For-Africa Programme, Government has acquired a vast array of agricultural equipment and tractors from Brazil for use by small-holder farmers, on a cost recovery basis. In the past, farmers small and large scale have benefitted from two phases of the Farm Mechanisation Programme implemented by Government. 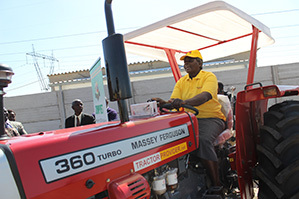 The ZIMPPET chairman, Abraham Deketeke said the mechanisation programme rolled out by the Trust was a show of gratitude to Government for giving back the land to Zimbabweans. “Our aim as a Trust is to support the efforts by Government to ensure that the Land Reform Programme remains a success,” he said. “Most of our members were failing to access loans from banks to fund their activities hence we saw it prudent to introduce this programme to assist them purchase farm implements. Deketeke said the mechanisation programme which is being rolled out in all the country’s provinces was one of the support programmes the Trust was rolling out. “In the past seasons we have worked with input providers to ensure that our members can purchase inputs such as seeds, fertilisers and chemicals on credit,” he said. Some of its programmes include bee-keeping in Buhera, Wedza, Mutorashanga and Rafingora, piggery in Makosa, Mutoko, Chivhu, and sack potato production in Tynwald, Glen Norah and Westlea and poultry in Concession. With more programmes in place to equip and support farmers, yields will improve in the country. Previous articleWill Pasuwa produce another miracle?